Most of us know that participating in relevant forums to our products and services can result in quality traffic and sales. What better place to find potential buyers than a busy forum that is specificly targetting people within your niche. Traditional methods of forum marketing is just a case of getting involved within the forum. Participating in discussions and offering free advice and tips for those requiring it. This builds your authority within the forum and people start to pay attention to you. Particularly your signature link that points people to your website, squeeze page or landing page. The problem here is that most people do not know how to maximise this exposure. Forums have hundreds, if not thousands of threads, created and read by often ‘thousands’ of members and guests. Here is a simple process to find relevant forums and the most relevant threads to start participating in. 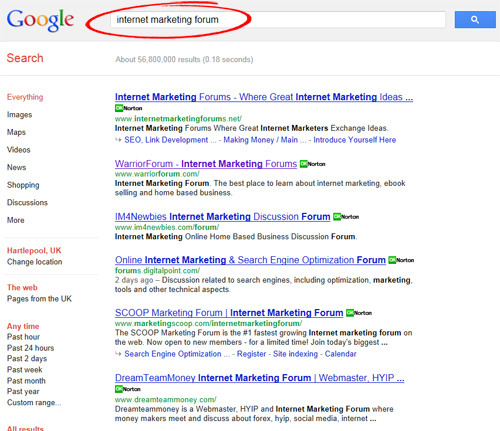 Step 1: Find relevant forums by searching in google for your niche’s main keyword followed by the word forum. Google will then return the most popular forums (multi platform) relevant to your broad niche. Step 2: Choose one of the forums listed and perform another search. 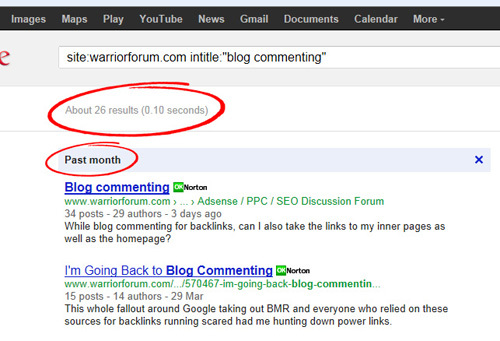 This time by returning results ONLY from that forum that have your chosen keyword within the page title of the thread. Check first that it is possible to add a signature link to your profile which will allow you to add some promotional copy or links to the bottom of EACH post you make. Sometimes you need to have a number of posts before this feature is active. 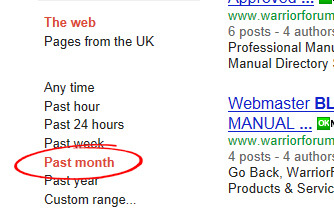 Step 3: Depending how many results are shown, you may want to narrow the results down to those indexed in a specific time frame, such as the ‘Last Month’. 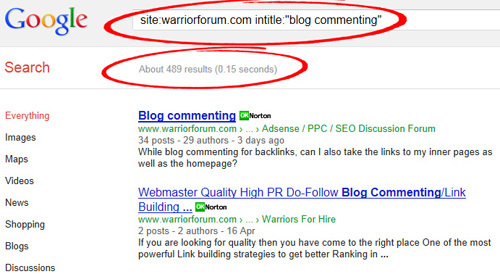 This will show you the most recent / active discussions that are related to your keyword. Step 4: Sign up to the forum, add some details about yourself and your business to your profile page, including a link to your website if possible. Create a signature link if it is possible to do so upon registering. Then visit a number of these relevant, recent threads and leave a valuable reply. Maybe give a valuable view or opinion or leave a tip or good advice. Some forums allow you to subscribe to the thread so you can see when others post in the thread. This allows you to get further involved when being notified of this. Step 5: Repeat this process on the same forum, and on others. Keep a list of the forums. You can use the same login details for all of the forums to make it quick and easy to login and participate. When forum members or guests see the value that you add they are likely to click through to your signature link to see what you offer. If the forums offer dofollow links then you will also gain quality, relevant links for your site from different busy forums which will also help your search engine rankings. Great post Andy and we can all take note of your pointers here. One thing though; don’t expect to see many forums when Googling ‘keyword’ + ‘forum’ you will be more likely to see sites relating to the quality of eastern European bananas than anything forum related……as of today (25th April) Google has officially fallen of a cliff and I give them 6-18 months before they are a distant memory – they have totally lost the plot! Yes, that was really to give an example using ‘search’. You can take a relevant forum footprint such as ‘Powered by phpBB” for example. Thanks for commenting. Andy I hope you don’t mind me dropping a link, but I just want to say that I ALWAYS enjoy your blog posts. I read your free stuff all the time, and I highly value and appreciate your quality advice, which you deliver from such a solid perspective! also, you inspired me to step my game up with the forums. I have been feeling like I am lacking in that area for awhile. Again, thank you so much for your advice. You’re welcome! Thanks for being a subscriber.